January 11, 2016, 8:36 PM · What happens when someone who loves classical music meets someone who loves jazz? A great conversation! Jazz violinist Christian Howes interviewed me last month for his Creative Strings Podcast, and we talked about all kinds of things: the early days of the Internet and the evolution of Violinist.com; finding common ground between beginners, teachers and elite players; things that are working in the business of classical music; and how we can all get along and promote what we love — violin music. And more. I hope you enjoy our talk! 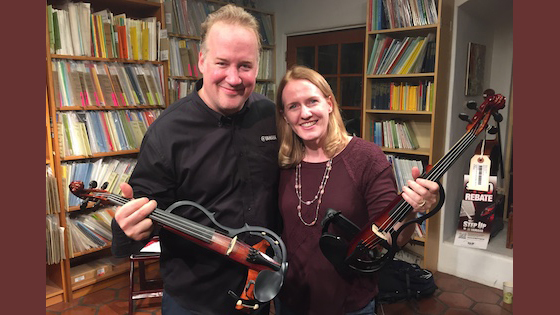 Jazz violinist Christian Howes and Violinist.com editor Laurie Niles. January 12, 2016 at 09:46 PM · I enjoyed the interview. The question about why there are disproportionately few female performers in jazz (except, perhaps, for vocalists) is a fair question but also quite a long-standing one. So don't feel bad that you didn't have a convincing answer; I've never heard one from anyone else either. January 12, 2016 at 10:50 PM · The question is a good one, though, and probably more important than answering why is simply fostering talent and promoting female jazz players!